1. 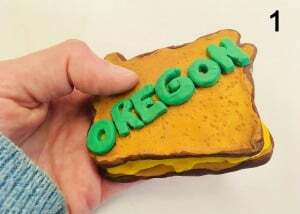 Cadet Montes created this polymer clay sandwich shaped like the state of Oregon for his Body project. 2. 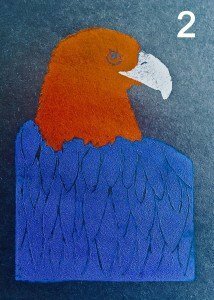 Cadet DelUniversita created this linoleum block print of a bald eagle using three separate pieces for his Extinction project. 3. 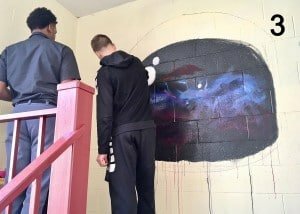 Cadets McKenzie and Urso are creating an astronaut’s helmet with a galaxy for their final project. 4. 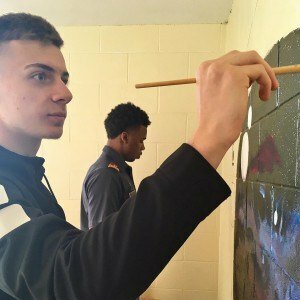 Cadets Lhermite and Kruk are working on a mural of Frida Kahlo. Beside them are Cadets Graham and Walker who are working on a jellyfish. 5. 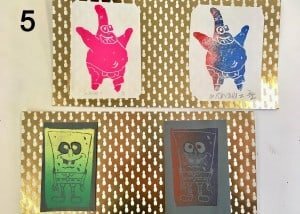 Cadets Zelenger and Sun created Spongebob and Patrick linoleum block stamps for their Childhood Printmaking project. 6. Cadet DelUniversita poses with Mr. Mavrikis. 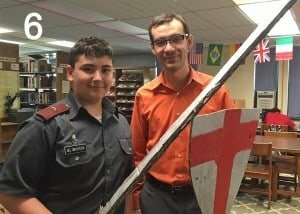 He is creating Medieval weapons out of cardboard and leather for the History Room.